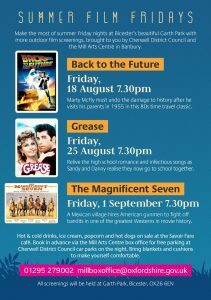 There are still 2 weeks of movies to go in the Summer Film Friday!! This week is Grease and the following week is Magnificent Seven. We look forward to seeing you there!! Please be advised of the temporary one way traffic order on Bucknell Road from 31 July to 7 August.